How to Always open a presentation in a Particular View in PowerPoint 2013? When working with the PowerPoint presentation, the users can specify the View in which the Presentation can be displayed. These include Normal, Outline , Slide Sorter , Notes Page and Reading View. When the users save the file, close it and again open the same ppt file, Microsoft PowerPoint 2013 would open the presentation in the view that the user had last viewed. 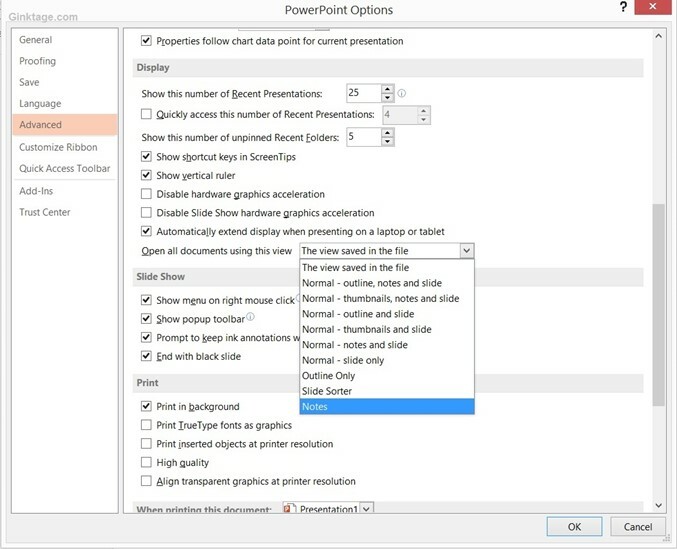 To enable the Microsoft PowerPoint 2013 to always open the presentation in the selected View. Follow the below steps. 1. In the Microsoft PowerPoint 2013, Select File -> Options. 2. In the PowerPoint 2013 Options Dialog, Select “Advanced” in the left sidebar and then identify the “Display” group in the Content Pane. In the Open all documents using this view drop down list, select the desired view and click OK button.